September 1, 2011 - Make sure you like EcoJoes on Facebook to stay updated on green ways to save money and help the environment. Just click the "like" button below. Muchas gracias! 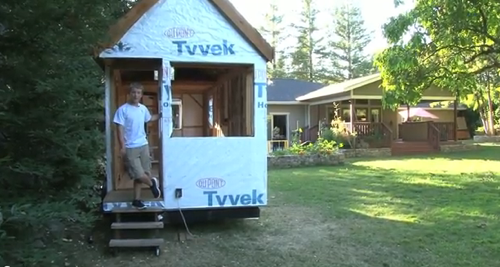 Have you ever wanted a tiny house of your own, but thought it’d be way too hard to build? What if you found out a 16-year-old (by the name of Austin Hay) was about to finish his very own small home? It’s just 130 square feet, but it’s 100% custom-made, plus has no mortgage! Not only does it waste a lot less building materials to build (plus use a less resources to maintain) a tiny house, but it can save you a chunk o’ change. As Mr. Hay himself put it, “Living small means less bills, living big means more bills. I don’t want to pay big bills”. Without further ado, I’ll let Austin take it away and give you a tour of his very own tiny house. If you’re all pumped up now to go off and build a lil’ casa, take a looksie at this tiny house book, first, just to see what you’re getting into. Posted in eco hero, green construction, save money	on Thursday, September 1st, 2011 at 9:23 PM. I'm so impressed with this young guy & his home. It's like a small apartment & I know he's going to love living in it. Let's hope that when he gets to college he can find somewhere to hook up to electricity, water, etc. That may be hard to find. The second problem may be keeping people out! All the college kids are going to want to live with him. Joking of course! There are so many homeless people out there that need to know about this. It's possible that they could build their own home & never have to worry about house payments again. Utilities are another concern. He may have to pay for electricity & water when he moves his home away from home. Danna, me too, me too. It's a good reminder that it's not impossible to build your own house, you just have to actually put in the work. I also thought that homeless people wouldn't have access to electricity to run a power saw, etc. Heck, they might not even own a power saw. I'm sure the young guy who built his house was using daddy's tools. Not many have access to that. I wish it were possible for the homeless to have access to tools, electricity, a vehicle to go find free products or cheap ones. But I guess that's wishing on a star. I'd love to see other kids build their own little homes like this to use until they get out of college & get good paying jobs. It's a great experience & gives them so much confidence. And, it's total freedom from living in a dorm & having to follow the rules & much cheaper! Some kids are having good sense of humor so they are always able to do such creative things all the time. This tiny house is looking very good and I sure want to see it in real.